For a few months now, the Westport Arts Center’s “MORE Than Words” exhibit has highlighted the importance of courage, resilience and empowerment in the face of bullying. It’s emboldened a variety of voices to speak out about the positive effects of empathy and kindness, and the negative results of exclusion. No one knows that subject better than teenagers. On January 29, their voices will be heard — loud and clear. 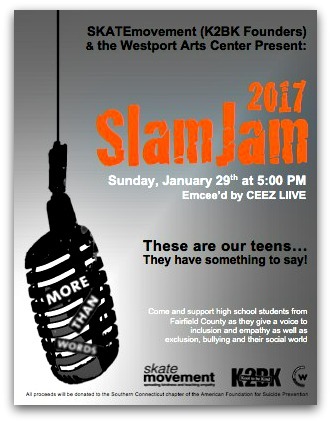 SlamJam (5 p.m., Westport Country Playhouse) is an evening of performances by Fairfield County teens. They’ll express how they feel about their stressful social world, and promote a kinder, more inclusive community. Songs, spoken word, rap, dance, music and film are some of the performance art genres on tap. 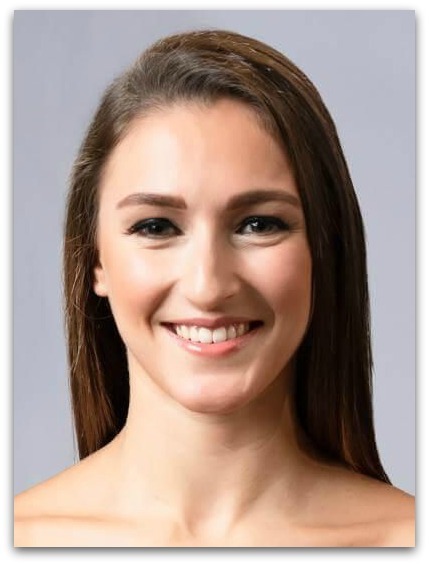 Performers will come from Westport and area towns — including students from Bridgeport’s All-Star Project and Neighborhood Studios. The event is produced by SKATEmovement. The acronym stands for Spreading Kindness and Teaching Empathy — an anti-bullying organization that teaches teens to be role models for younger children. All proceeds go to the Southern Connecticut branch of the American Foundation for Suicide Prevention. These are our teenagers. They have plenty to say. And very creative, powerful ways of saying it. Harold Levine emailed me recently. He’s 93 years old. 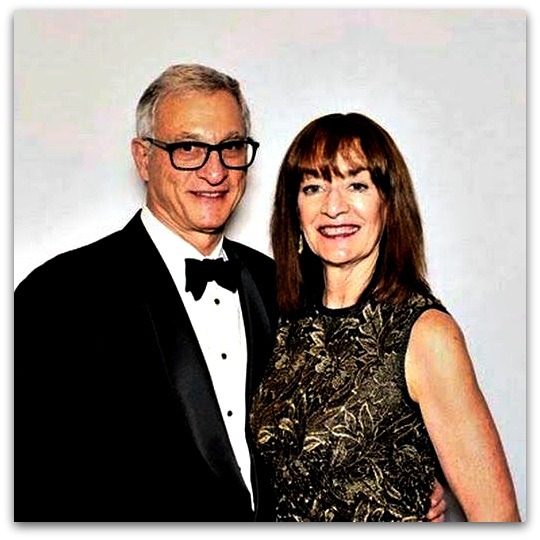 But the famed advertising executive — who is also chairman emeritus of Neighborhood Studios, an after-school, weekend and summer music, arts and dance program for Bridgeport students –is as passionate as ever. I just received a troubling phone call. Our executive director projects that by the end of our fiscal year on August 30th, we will be over $80,000 in debt. We are seriously understaffed. So why the deficit? Why can’t we get enough money to provide arts experiences to over 1,500 children? Is it because they are poor? Is it because they don’t live in our community? Is it because they are black and Hispanic? Neighborhood Studios was founded over 35 years ago by Pat Hart, a young woman who became blind at 28. She was committed to teaching art and music to blind and other handicapped children. Over the years the organization has grown to serve all Bridgeport children. For example, for private piano lessons we ask parents to pay $3 per sessions. Many tell us they cannot afford even that little. Are we to turn that child away? Of course not. That’s one reason we end the year with a deficit. For the past 15 years we have sponsored Ailey Camp, a 6-week summer program in cooperation with the Alvin Ailey American Dance Company. Bridgeport is one of only 7 such camps around the country. Besides a great dance program, youngsters are also trained in speech, writing, and feeling good about themselves. Many campers return as interns and instructors. This is a program that everyone in Fairfield County should be proud to support. The campers (and their parents) are carefully interviewed. Each family pays only $25 for the entire summer — yet each camper costs Neighborhood Studios over $1,000. We are looking for patrons of the arts. I was once told that if Neighborhood Studios was headquartered in Westport, we would be loaded with money. Our programs work. We are successful in getting a high percentage of our children to go on to college. We must continue to serve the children of our neighboring community, Bridgeport. Harold Levine asks Westporters to help their neighbors. For a long time, Neighborhood Studios needed a good documentary film, to show to prospective donors and sponsors. The weekend and summer music and arts program serves 1600 Bridgeport youngsters each year. It’s very effective — but low-key, and chronically underfunded. There was no way to find the thousands of dollars a film production would charge. A few months ago, Westporter Harold Levine — the organization’s 93-year-old chairman emeritus, still very active after a long career as a storied ad agency owner — approached a former colleague. Tony Degregorio is a noted adman himself — and a Westporter. He agreed to be creative supervisor of the film. Junior Daniel Pauker joined as production assistant. Levine’s next call was to longtime friend Doris Jacoby. For decades, her Jacoby Storm company has produced documentaries for major corporations and non-profit clients. She too eagerly signed on. The result — a volunteer effort by talented Westporters, to help boys and girls in nearby Bridgeport — premieres on Sunday, March 15 (7 p.m.) at the Westport Country Playhouse. The Bill T. Jones/Arnie Zane Dance Company will perform. They’re not from Westport. But like Harold Levine, Tony Degregorio, Arin Meyer, Daniel Pauker and Doris Jacoby, they’re eager to help Neighborhood Schools — our Bridgeport neighbors just a few miles away. He sold the company to Grey Advertising, then spent the first part of retirement helping Ukraine develop an ad industry (after the Soviet Union disintegrated). At 91 years old, Levine is still working. This month he traveled to Vienna, where his Kiev-based agency just opened a new office. Levine’s other passion lies closer to Westport, his home for the past 35 years. He’s chairman emeritus of Neighborhood Studios, which provides after-school, weekend and summer music and arts programs to 1600 Bridgeport students a year. It’s been a life-changer for countless youngsters. But just a few miles from Connecticut’s largest city, few Westporters have any idea it exists. 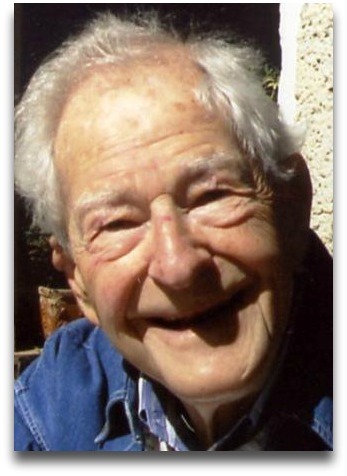 Levine’s long connection began with his late wife Sue. After meeting Pat Hart, a blind arts educator, she committed herself to bringing art and music to blind and handicapped Bridgeport youth. At the time, Levine was board chairman of the Alvin Ailey Dance Company. When he saw that organization using dance to help ease racial tensions in Kansas City, a light bulb lit up. Levine had always been interested in education — before moving here, he served on the Freeport, Long Island school board — and with Sue, he helped introduce the Alvin Ailey Camp to Bridgeport. The camp — which ended earlier this month — is just one component of Neighborhood Studios. The hugely successful program has produced professional musicians and artists, and sent graduates on to college at a far higher rate than the Bridgeport norm. One, for example, is currently at Berklee College of Music; another is a pre-med and dance major at Howard University. Earlier this summer Steffi Friedman — a Westport sculptor who teaches in the program — took nearly a dozen students to the Metropolitan Museum of Art. None had ever been to New York City, or a museum. Levine has hoped that Westport would embrace Neighborhood Studios — perhaps even partner with it. 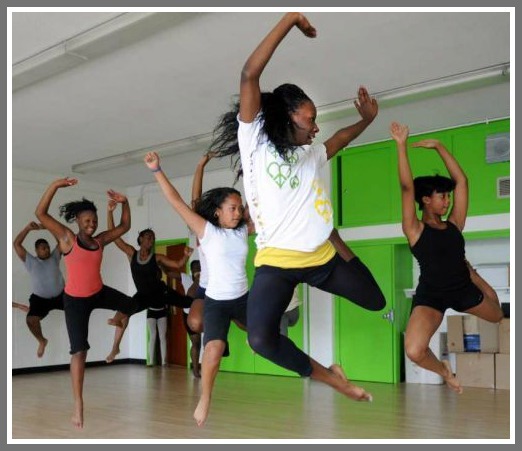 He’d like to tap into our music, dance, theater and arts talents, as instructors. But he’s found that many here fear Bridgeport. Folks will write a check — but won’t go there. He’s even heard people say they moved to Westport to get away from places like Bridgeport. Laurie Gross is one who has. The current chair of Neighborhood Studios, she got involved more than a decade ago when her daughter — a dancer — volunteered at the Ailey Camp. It changed her life — and Laurie’s too. Meanwhile, Levine promotes the program he is so proud of. And — with the enthusiasm and energy of a man half his 91 years — he urges other Westporters to do the same.